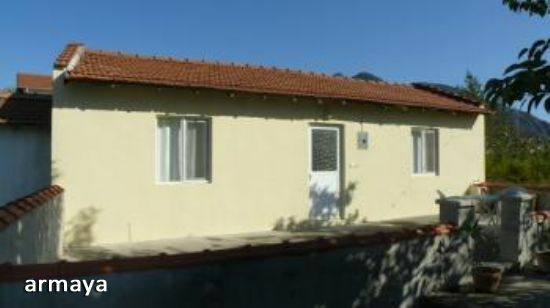 Perfect for large familes and for rental investment. 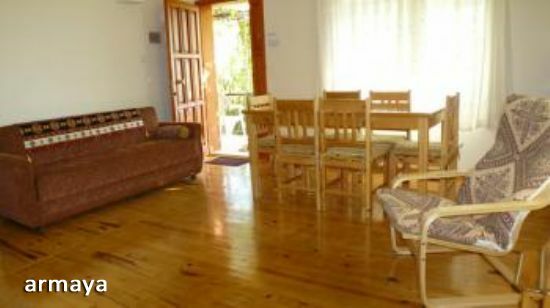 The property has been developed as four self-contained apartments. 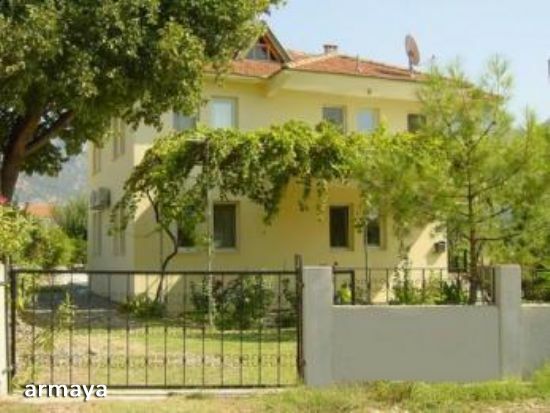 The property is in a semi-rural area with fields around it but is still lies 15 minutes walk to the town centre of Dalyan. 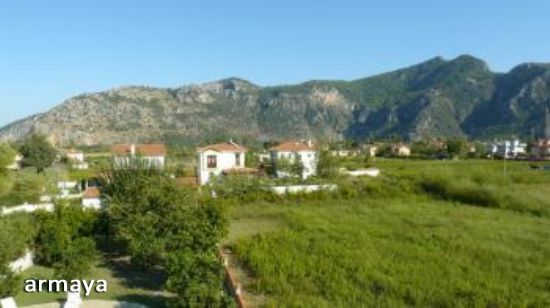 The property is boarded by stone walls and has mature gardens to both front and rear the gardens have a variety of fruit trees including orange and lemon . Grapevines climb over the pergola at the side of the villa with many flowering plants . 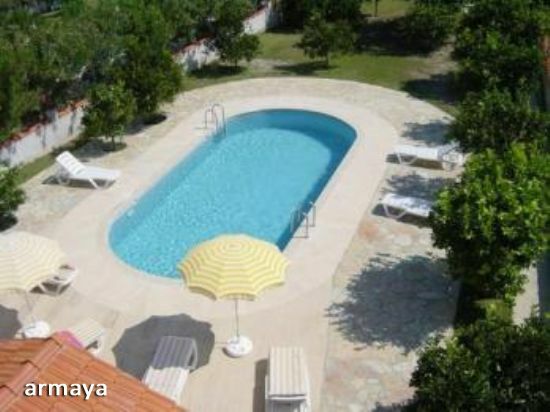 The large pool is to the rear of the property along with the one bedroomed bungalow . The property has been refurbished over the last five years so renavation on kitchen areas and UVPC double glazing windows have been added the painting and other areas have all been taken great care of each year so making this a very attractive home. The property already rents out for 15 - 17 weeks of the season and can earn an estimated 15,000 GBP every year. The ground floor apartment is accessed via steps to it’s private balcony. The front door leads into the large lounge (17ft 7in x 14ft 4in) which has a wooden floor and dual aspect windows with views of the front garden and fields to the side.Next door is an L shaped corridor (8ft 8in x 3ft 9in and 7ft 8in x 3ft 2in) off of which is Bedroom 1 (10ft 8in x 12ft 4in). 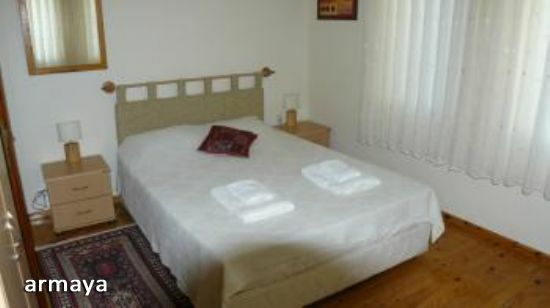 This room again has dual aspect windows and wooden floors and currently has twin beds. It is spacious and light. The second bedroom (13ft 1in x 10ft 8in) is at the rear of the property and has lovely views of the pool and garden. The bedroom is furnished with a double bed and has an ensuite shower room (7ft 5in x 3ft 9in) which is fully tiled in shades of blue and white with white fittings. There is also a family shower room (7ft 2in x 4ft 2in) which is again fully tiled in blue and white with white fittings. The kitchen is fitted with a range of light wood effect floor and wall cabinets with marble worktops and tiled splashbacks. Whıte goods include hob, extractor and fridge. There is a door leading to the balcony (26ft 2in x 4ft 2in) which has lovely mountain views. Outside there is an understair room which houses the washing machine. The first floor apartment has the same layout as the ground floor. The even larger lounge (23ft 9in x 14ft 4in ) has a long private balcony (18ft x 4ft 2in) spanning the front of the property which affords views of the rock tombs both during the day and when they are brilliantly lit up at night. There is also a balcony off the kitchen (8ft 4in x 4ft 9in) which has fantastic views of mountains and the surrounding fields. 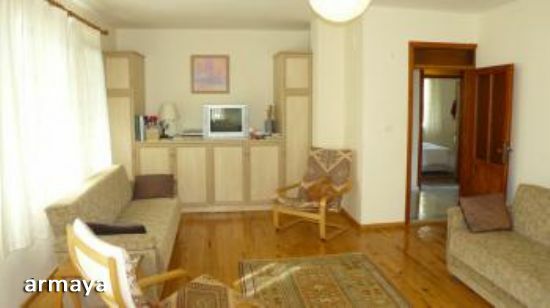 This apartment also has two bedrooms which have the same dimensions as those on the ground floor but with the enhanced views of being one floor further up. Stairs lead to a self contained apartment in the roofspace. This has ample headroom in the large lounge/kitchen area (17ft 4in x 20ft 3in) which has ceramic floors and wooden ceilings. The bedroom (10ft 2in x 11ft 5in) has a balcony (8ft 4in x 4ft 9in) from which you can see several mountain ranges. There is a small shower room (5ft 9in x 5ft 4in). This apartment is not yet fully finished though there is very little work left to be done. All the apartments 1 to 3 have pvc windows with mosquito screens and solar powered water heating.